Based at the thriving Harlow Enterprise Hub, Research Runner Ltd, have the perfect base from which to drive their business forward. As a global sales consultancy who specialise in Market Research, Research Runner Ltd offer unique new business lead generation and Market Research services. Company Directors Tracey and Julian Haste are proud of their experience in the industry and how they have helped to support businesses to achieve success. 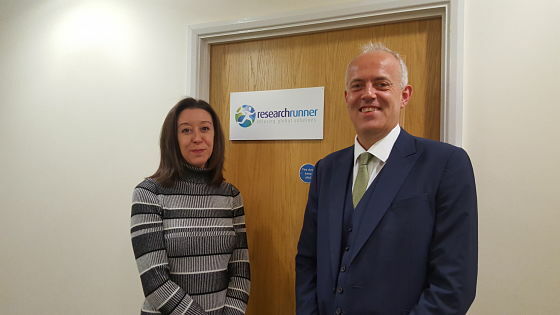 We spoke to them about Research Runner Ltd.
As a global sales consultancy, Research Runner Ltd offers a sales platform and support to all companies who want to generate new business. We have over 20 years’ experience within the industry. We created the company primarily to ‘help’ the researcher, having previously worked in all aspects of research. We specialise in market research, and work in partnership with our clients. We have also been awarded the Highly Commended Operations Award 2015 from the Market Research Society. Research Runner Ltd was founded in 2010. Initially we had just one client, and over the years, the business has grown significantly. During this time, we have encountered many challenges, but it is all part of running a business. By facing obstacles head on, and by working closely with clients, we ensure agreeable solutions are found, lines of communication are always open, and our great relationships with clients continue. From a professional point of view, it gives us great pleasure knowing that we are helping companies to grow their own business with our sales support. From a personal point of view, it is providing us with a quality of life that we hadn’t managed to achieve before. Growing your own business always comes with its own challenges, but the sense of achievement and fulfillment is worth it! How has being based at Harlow Enterprise Hub supported your business growth? Nwes staff are always on hand to assist in any way they can should we require their help. The office building is presented well for receiving any clients that walk through the door. We have also been able to upgrade our office space and continue with our business without any interruptions. Do you have any words of wisdom for others considering setting up their own business? If you believe you have a great product or service and you want to set up your own business, don’t question it, just do it. Above all, never give up. Just keep going.